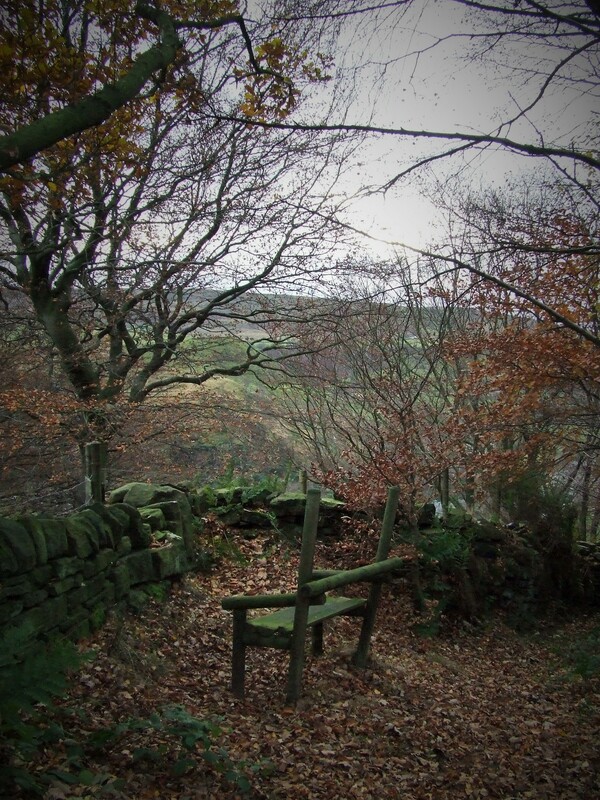 The seat in the wood has intrigued me since I stumbled across it, looks home made, old – it has certainly seen its fare share of winters, I guess. It doesn’t overlook a repose worthy view and the valley’s features are obscured by the wall when seated, but is certainly a welcome resting place from the steep climb of the valley side. A haunting melancholy spot in an old oak forest – to come home to a meal of rosemary and olive bread is certainly what’s needed to cheer up the spirit after today’s walk! Check out the recipe below. Measure out the lactose free milk, add eggs and olive oil mix well, add salt to season. Weigh out the gluten free flour and add the xanthan gum, and mix well. Grate the Parmesan cheese and add 2/3 to the flour leaving the remainder to sprinkle on the finished bread. Chop the rosemary finely and add to the flour. 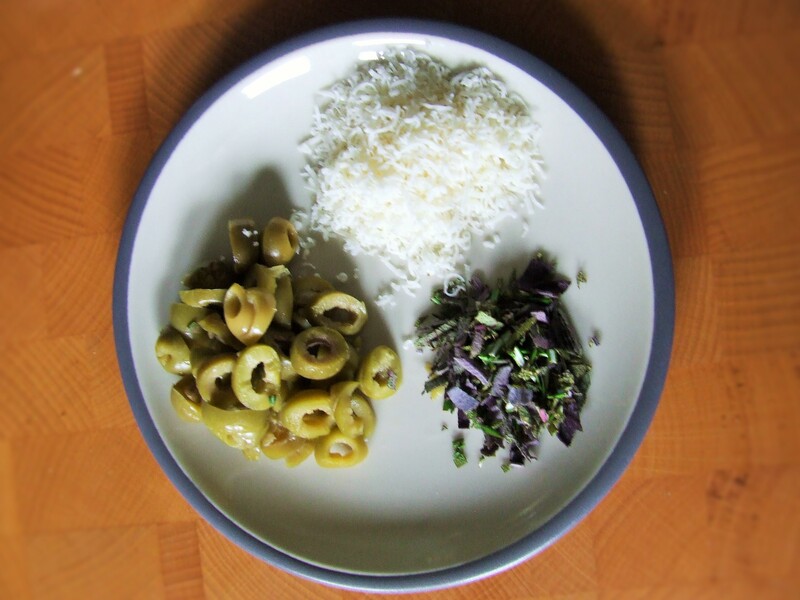 Slice the olives and add 2/3 to the flour leaving the remainder to decorate the top of the bread mix before cooking. Mix the Parmesan and olives into the flour, make a well in the centre of the flour mix and add the liquid ingredients. Incorporate the liquid into the flour till everything is blended in. The finished mix has a slightly sticky texture. Oil a tray well and add the mix, wet your hands and smooth the surface and add a thumb print in lines down the bread as a decoration. Add the remaining olives and cheese. Cook for 40 minutes or until a skewer inserted into the bread comes out clean at gas mark 6 or 220 degree centigrade. For a low fodmap diet xanthan gum is possibly fermentable but is in the bread in very low levels (less than 0.5%) so most people should be OK to have a portion. When I initially became involved in treating people with coeliac disease I decided that it would be good to try to follow the gluten-free diet to see what the problems were, this post is a copy of my reflection and was originally written in 2009 – some of the issues I experienced will not have been made any easier in the current economic climate. I feel the need to share this with you – I may try to persuade you to continue following your gluten-free diet to ensure optimum health, but I do appreciate this is no mean feat to achieve! I REALLY like bread and my favourite meal of the day is breakfast when I have a bowl of cornflakes (what??? a dietitian not eating a fibre based breakkie? – let me assure you, I do eat plenty of fibre :-).) I have some experience of changing my breakfast cereal for unnamed brands to try to save money and I have to say I failed miserably, as many brands fail to keep their texture once in milk and often taste very bland. I therefore eat a certain very well-known brand of cornflakes. As such I was not looking forward to the experience of having to change, but I felt it was worthwhile. I decided to purchase everything that I used to see what difference it made, the diet is very expensive and Coeliac UK surveys suggest that it adds ten pounds to a shopping bill (don’t forget this was written in 2009) despite foods being available on prescription, as food prices have increased since then, this data is probably now a conservative estimate. This may result in people with coeliac disease not purchasing gluten free foods and this is particularly relevant at the moment, as many people are managing on very tight budgets. One issue that did vex was that many foods in the dietary allergy section of the supermarkets are expensive, often ORGANIC (this is a luxury lifestyle choice in my view, and might pander to those who manipulate their diet by choice, and not medically evidenced/diagnosed as required, often these individuals can afford to spend more on their diet. Although – why shouldn’t people with Coeliac Disease have a choice of organic you may ask? – that’s fine, as long as there are also standard alternatives available.) The problem is, when newly diagnosed coeliac, and not used to using the Coeliac UK food directory, people will obviously choose foods that are easily identifiable, as they must have something to eat. This may well be in these specialist sections in the supermarket where 1/ not everything may well be gluten-free, as the section is for all food intolerances (still need to use the gluten free food directory) and 2/ cheaper gluten free versions might be available in the rest of the store (again looking at the directory will help.) I found the most time effective way of doing this is to write the usually consumed foods on a list and to either do a search on the Coeliac UK online food directory, or match the foods from the directory in the store that is used, prior to visiting the supermarket. Initially my breakfast was a huge disappointment, the first cereal I purchased was an organic gluten free cereal flakes that was at the allergy section of the supermarket, it was extremely expensive, and as I normally consume a large bowl it only lasted five days. Reducing the portion size resulted in hunger so I then had to add a slice of gluten free toast and jam. This cereal tasted good, but I obviously couldn’t afford to continue using this. The same supermarket had cornflakes available in their own brand range, in the directory, and much cheaper, but only available in the cereal section – not the free from section, clearly to the supermarkets advantage. Another organic and expensive (arrgh!) cereal was then used (larger packet for same price as the first option), this did not go soggy, but tasted like cardboard, and it went straight in the bin. I sometimes eat porridge, so my next foray into trying to find a suitable breakfast was to make some GF porridge (not made with gluten-free oats – remember people newly diagnosed are asked to avoid GF oats initially,) the really weird thing was that the rice based cereal smelled and looked like porridge when it was being prepared and the rice flakes kept their texture well. It was just a bit disappointing as the porridge didn’t quite have the mouth feel of normal porridge, (I also HAD (??) to add some maple syrup as a treat, as by this stage I felt mildly irritated that I was not able to eat my usual diet, resulting in an increase in calories!). The most agreeable breakfast solution was toast and jam, but this obviously reduced my milk consumption, an important source of calcium and a good learning point. Another thing I have learned was when I ran out of bread and did not have enough for my lunch I resorted to unhealthy snacks (crisps) that I knew were suitable, as the salad I had prepared did not satisfy my appetite. The options to choose when eating out are less. I also incorrectly assumed that I would lose weight as the portions of the gluten free foods were smaller, I had assumed that weight gain post diagnosis was as a result of better absorption of nutrients. But shock, horror, the smaller portion sizes OFTEN CONTAIN THE SAME CALORIES!!! People might eat more portions of the bread, increasing calories consumed and need to be informed of this. This realisation was more than a bit of a shock and was one of the causes of my relapse into eating a gluten based diet. I lasted on the diet about three weeks, it was a very emotional time, I felt deprived, was constipated, poor, possibly gaining weight (didn’t weight myself) and generally very, very grumpy. I now know that it can take time to get used to the diet and the free samples are very useful to identify which foods are tolerated best. The emotions involved cannot be underestimated and as this diet needs to be permanently adhered to it is probably one of the most difficult life changes to make. Even more difficult than weight reduction, as a few changes at a time can make a difference with managing weight, I’m not suggesting that managing ones weight is EASY, far from it. More difficult than stopping smoking or drinking alcohol, as this can be stopped completely and again I’m not underestimating the problems people have changing these aspects of their lifestyle – but coeliacs still need to EAT! Patients that are symptom free will not feel a strong compulsion to change, and if young, slight increased risk of cancer and osteoporosis, may not be a strong a enough deterrent. I also realised it is very important to help people in clinic to identify their own symptoms to help them to move to a position of making changes some symptoms are sometimes unrecognised, such as tiredness and bloating. I have now gained so much respect for those people who follow the diet and following the diet placed me in a much better position to help by improving my knowledge. I am still going to continue to try foods, it is important that I do, as I have found good bread and cereal, but not follow the diet 100%, as not being diagnosed as Coeliac, I am extremely fortunate to be able to choose! How my practice has changed – I have now increased my knowledge of the gluten-free diet and probably just as important I have some idea of the difficulties experienced by patients that are newly diagnosed, this has informed my practice and I can now give more detailed information to patients. I have joined Coeliac UK and find their website very useful to have on the screen in clinic and I can download information for patients directly. This also gives them the idea that joining would be useful as all the information is available to them. I hope you appreciate my honesty in this reflection and I would also strongly advise any new gastro Dietitian to follow the diet as there is no better learning experience.